While each of the 16 Style Types has a unique approach to style, comparing all 16 Style Types can be rather cumbersome. We wanted to find a way to simplify or “chunk up” to four groups, to add a layer of simplicity to understanding style + personality. Given our collective experience in working with this model of personality – ‘psychological type‘ – we knew we could chunk the 16 Style Types up to 4 groups, by identifying the similarities we found in our research. So we took the time to examine what was similar and different across all 16 Style Types, comparing several ways that the 16 Style Types might be sorted into four groups—and sure enough, we found four “Super” approaches to style. 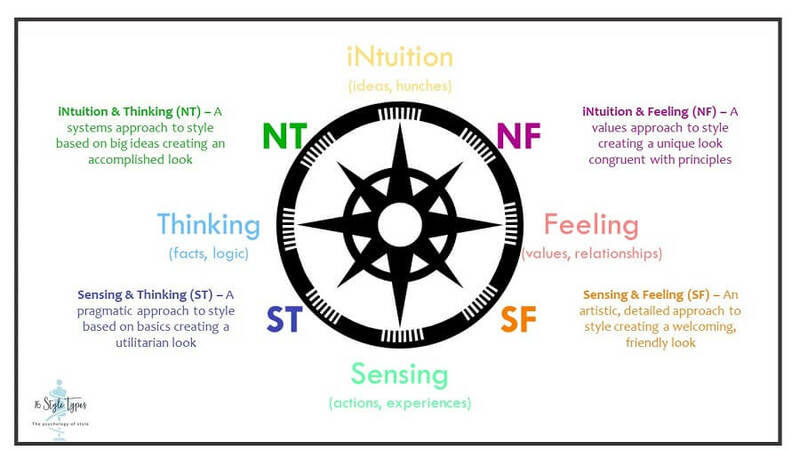 These four Super Styles are defined by what is known as the function pairs, the two middle letters of a person’s psychological type: Sensing and Feeling (SF), Sensing and Thinking (ST), iNtuition and Thinking (NT), and iNtuition and Feeling (NF). If you already know your Style Type, it’s interesting to ask yourself: which are your two middle letters, your function pair, your Super Style group? The Super Styles capture the information we trust and how we make decisions– the heart and soul of type. Research has shown that people who share the same Super Style (or, in the vernacular of the theory, the same function pair) find common ground in how they communicate, approach life, how they make decisions and how they approach the process of gathering trusted information – sometimes even in the careers, they seek. And, as we discovered with our years of research, in how they approach, define and experience their style. Each of the four Super Styles is distinct from one another, each has characteristics and defining markers not found in the others. Understanding yours will help you understand where style fits into your world, how you have come to your experience of style and to define your unique style journey, and ultimately to how you express your style. And just like any compass, understanding your Super Style — where your ‘true north’ is — will help you identify and navigate your style pathway. Understanding your Super Style will give you a broad overview of what makes up the essence of your unique Style Type. It will be a solid touchstone you can come back to and rely on if ever you feel yourself getting off-track with your style. It will guide you “home” if need be. Your Super Style points the way. It gives you the broad direction in which you should travel to discover your authentic and true style pathway. Equipped with this compass pointing to your own ‘true north’, you’ll never be lost on your style journey ever again. You will always know which direction to orient yourself in, and which steps you should take with confidence, knowing you are heading in the right direction. You need never be adrift, confused or lost again on your style journey. An artistic, detailed approach to style, creating a welcoming, friendly look. Sensing is about paying attention to facts, what can be verified. Feeling is basing decisions on their impact on people—how the details matter to individuals. Together Sensing and Feeling are adept at solving practical problems and building relationships. They value the emotional well-being of others and enjoy being of service. Keys to the SF style are being friendly and hands-on. They place value on having their input noticed and appreciated. Read more about the SF Super Style here. A pragmatic approach to style based on basics, creating a utilitarian look. Sensing is paying attention to facts, what can be verified. Thinking is basing decisions on logical analysis and principles. Together Sensing and Thinking are adept at allocating resources and establishing procedures. They value consistency and efficiency. Keys to the ST style are being brief and responsible. They place value on factual certainty. Read more about the ST Super Style here. A systems approach to style based on big ideas, creating an accomplished look. iNtuition is about paying attention to global picture, theories, insights, and connections. Together iNtuition and Thinking are adept at analyzing complex problems and fostering growth. They value competence and global concepts. Keys to the NT style are being prepared to be challenged and letting them draw their own conclusions. They place value on finding flaws that others cannot see. Read more about the NT Super Style here. A values approach to style, creating a unique look congruent with principles. iNtuition is paying attention to the big picture, connections, hunches. Feeling is basing decisions on the implications for the well being of others. Together iNtuition and Feeling are adept at inspiring others and envisioning the future. They value creativity and community. Keys to the NF style are being idealistic and focusing on the development of others. They place value on serving societies needs. These four Super Styles are the heart and soul of style personality. When understood, they bring a depth of insight into the nexus of style + personality that no other style system in the world does. Understanding your Super Style brings you into closer contact with the essence of your personality, of how you approach life and why you are the way you are. There is no greater gift, to yourself, to those you love and to the world, than to become more truly yourself. Embracing your Super Style will help you understand and define your unique style journey, and to express your style in a way that is perfect for you. Discover your Style Type in depth with your detailed Style Type Report. If you are already know your four-letter type, click here to get your Style Type report. 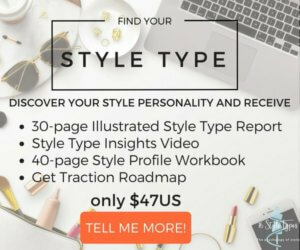 If you are not 100% sure of your four-letter type, may have been mistyped in the past or simply wish to take a fresh and authentic look at what makes you, you discover your Style Type here.